Experience the alpha and omega of mobile photography, exceptional AI-driven performance and excellent battery life, with the Huawei Mate 20 Pro. Enhance the sense of space in your photos, and capture group shots like never before with the world's first ultra wide-angle Leica triple 40MP+20MP+8MP camera. Take your selfies to the next level with a 24MP front camera ? all with the Huawei Mate 20 Pro. View your photos and videos on a stunning 6.39 inch QHD+ OLED screen with brilliant colours and high contrast. Enjoy an immersive viewing experience thanks to the Mate 20 Pro's elegant, borderless design ? complete with a notch for the selfie camera, and handy sensors. 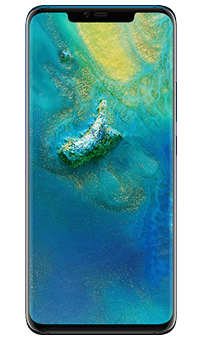 Go up to two days on a single charge with the Huawei Mate 20 Pro's 4200mAh battery, and charge it to 70% in just 30 minutes. What's more, the Mate 20 Pro is the world's first smartphone that can wirelessly charge other Qi-compatible devices using its own battery. Enjoy faster, more efficient and intelligent performance with less power consumption thanks to the world's first 7-nm mobile AI chipset. Keep your photos and data safe with the Mate 20 Pro's 3D facial recognition or in-display fingerprint unlock features ? all driven by AI.